In June 2009, NASA and the U.S. Geological Survey put the finishing touches on a new collection of mapped images covering the entire land surface of the Earth and made them available to anyone, anywhere in the world, absolutely free. The result of a collaboration between NASA, the U.S. Geological Survey, and the U.S. National Geospatial Agency, the Global Land Survey 2005 features around 9,500 images from NASA’s Landsat satellites captured between 2004–2007. The images are detailed enough to make out features as small as 30 meters (about one-third the length of an American football field), they have been carefully screened for clouds, and each one shows the landscape during its growing season. Some of the images are as striking as a piece of artwork. Stitched together into a single mosaic, the collection paints the most detailed picture of Earth’s land surface a person can get for free. Before you think about ordering it, however, consider this: to view the entire thing at full size, your computer screen would need to be as big as the Hoover Dam. The survey’s pretty pictures are just a fringe benefit, though. The real motivation for the project, explains remote-sensing scientist Jeff Masek, the NASA lead on the project, was the increasingly urgent need among Earth and climate scientists for a detailed global image of the land surface in which the latitude, longitude, and elevation of every pixel had been mapped. Scientists need this view in order to understand the extent and pace of changes people are making to Earth’s surface. Landscape changes affect the climate, but perhaps more significantly, they will determine whether Earth’s natural and managed ecosystems are able to sustain the human population as it grows to a projected 9 billion people in the next 40 years. Of course, scientists could have used this detailed, global view several decades ago, and in theory, the earliest Landsat missions could have provided it. But only recently have scientists been able to handle the expense and the technical challenges of mapping the world with Landsat images. When the first Landsat launched in 1972, virtually every piece of technology that we think of as essential for viewing, sharing, or analyzing digital images either hadn’t been invented (like the World Wide Web and DVDs) or hadn’t been commercialized (like the microprocessor that runs desktop computers). Two technicians examine Landsat 3 during its assembly in 1977. 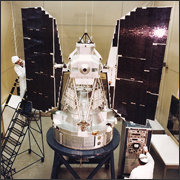 The earliest Landsat satellites predate most contemporary computer technology. Each Landsat image is several hundred Megabytes. Until recently, it would have taken a super computer to sort, join, and geolocate (map the latitude and longitude of) the thousands of images needed to make a global picture. “For decades, the computing challenge was huge,” says Masek. The challenge of handling the data translated into prices that few researchers could afford. “For a number of years in the 80s and early 90s,” said Masek, when the satellites were being operated by a commercial company, “it cost about $4,000 for a single Landsat image, and it takes about 9,000 of them to map the land area of the globe.” To make a global image for just one time period would have cost $36 million. When the government resumed satellite operations in 2000, the price per scene dropped to about $600, says Masek. And since late last year, all the Landsat scenes in the USGS archive have been free. With prices dropping, in the late 1990s, NASA began working on Landsat image mosaics centered on 1975 and 1990, and a 2000-era collection came out a few years ago. Price may have been the primary obstacle to global Landsat mosaics for many years, but according to John Dwyer, the USGS lead on the Global Land Survey 2005 project, “monumental” technical challenges remained. For a global picture circa 2005, an analyst would have to repeat this process more than 9,000 times, sorting through the roughly 500,000 images captured by Landsat 5 and Landsat 7 between 2004 and 2007. “A person just can’t do that,” says Dwyer. Instead, NASA scientists developed a sophisticated search engine that sorted through the archive and found images that were the best compromise among various criteria set by the scientists—for example, season, cloud cover, or satellite preference. Even with the hundreds of thousands of images available in the USGS archive, though, getting an image of every land surface on Earth wasn’t easy. In 2003, a part of the Landsat 7 sensor failed. The result was that the outside margins of all the images had stripes of missing data. “It was a real headache,” says Masek. The back up plan was to fill in the gaps in the collection with images from the older, but still-operational Landsat 5 satellite. But Landsat 5 doesn’t have an onboard data recorder. It continuously broadcasts what it is seeing below, but it doesn’t store the images. In the United States, ground stations downlink data whenever Landsat 5 passes overhead. Once the satellite passes out of communication range of U.S. ground stations, though, its images are out of reach, complicating the goal of a global image mosaic. Fortunately, U.S. stations aren’t the only ones tuning into Landsat. “There are about a dozen international Landsat receiving stations, but we [USGS and NASA] don’t have any formal agreement with them to repatriate the data,” explains Masek. So the USGS offered the foreign stations a complete copy of the whole global data set in exchange for access to images that were within their station’s acquisition range. The partnerships with international ground receiving stations made the coverage nearly global. The last obstacles to creating a complete image collection of all land areas on Earth were the hundreds of tiny islands and reefs scattered across the world’s oceans. Except over the United States, says Masek, “Landsat doesn’t acquire every image on every overpass. For the rest of the world, the satellite may only acquire a target a few times a year.” To complete the collection, the team tasked the Advanced Land Imager on NASA’s EO-1 satellite to image the smaller islands and reefs. Anyone who has stood before a spectacular vista and taken a series of overlapping photos in the hopes of turning them into a panoramic image has probably experienced the frustration of trying to get the resulting photos to line up. You line up the mountains in the background, for example, and see that a road running through the foreground no longer overlaps. These small distortions occur because as careful as you try to be when you take the picture, you can’t hold the camera at exactly the same angle as you shoot each image. You may lower the camera a fraction, or lean forward a tiny bit. Satellites experience the same small wobbles as they fly through space, and the impact on images is similar. Changes in the angle of view change the relative size and distance between features in the images. Rugged terrain is a problem, too. If scientists don’t account for the topography when they turn the satellite data into images, the same landscape feature might look compressed in one image and stretched out in another, or it may appear to have shifted location by a several hundreds meters from one image to the next. “It’s sort of like the image was on a piece of fabric, and it got wrinkled up,” says Masek. Smoothing the images out is critical for scientists who want to compare images of the same area over time or to combine satellite images with other types of geographic data, such population density, land ownership, or roads. 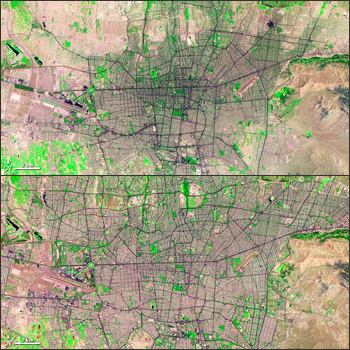 To correct the distortions (geographers call the process orthorectification), scientists have computers compare new satellite images to a library of ground control points. The control points are snippets of an image centered on a recognizable feature whose geographic information—latitude, longitude, and elevation—is precisely known from ground surveys. Computers identify features in the new image that match the control points, and maximize the alignment of all the features by resizing or rotating the new images. The orthorectification of the 2005 version of the Global Land Survey is significantly more accurate than previous versions, mostly because of improved topographic data provided by the Shuttle Radar Topographic Mission, which flew on Space Shuttle Endeavor in 2002. For areas outside the United States, the Shuttle data improved the topographic detail by a factor of 10. “That alone resulted in dramatic improvement of geo-registration for many areas of the world,” said Dwyer. The improvements were so dramatic that Masek and his collaborators persuaded NASA and the USGS to chip in some extra money to reprocess the 1975, 1990, and 2000 collections to match the 2005 Global Land Survey. NASA and the USGS are now working on the next iteration of the Global Land Survey, centered on imagery collected during 2009 and 2010. The Global Land Survey 2005 project was funded by NASA’s Land Cover Land Use Change Program and the U.S. Geological Survey. Gilbert, M., Xiao, X., Pfeiffer, D., Epprecht, M., Boles, S., Czarnecki, C., Chaitaweesub, P., Kalpravidh, W., Minh, P., Otte, M., Martin, V., and Slingenbergh, J. (2008). Mapping H5N1 highly pathogenic avian influenza risk in Southeast Asia. Proceedings of the National Academy of Sciences, 105(12), 4769-4774. Giri, C., Zhu, Z., Tieszen, L., Singh, A., Gillette, S., and Kelmelis, J. (2008). Mangrove forest distributions and dynamics (1975–2005) of the tsunami-affected region of Asia. Journal of Biogeography, 35, 519–528. Gutman, G., Byrnes, R., Masek, J., Covington, S., Justice, C., Franks, S., and Headley, R. (2008). Towards Monitoring Land-Cover and Land-Use Changes at a Global Scale: The Global Land Survey 2005.Photogrammetric Engineering and Remote Sensing, 74 (1), 6-10. Tucker, C., Denelle, M., and Dykstra, D. (2004). NASA’s Global Orthorectified Landsat Data Set. Photogrammetric Engineering and Remote Sensing, 70(3), 313–322. This entry is filed under Did You Know?, News.